Twelve miles northwest of St. Louis Missouri is the city of Ferguson, a community which has risen to public consequence because of the August 9th 2014 fatal shooting of unarmed black teenager Michael Brown by police officer Darren Wilson. The death of then 18 year old Brown incited public outrage, causing bouts of local civil disorder, community protests, and violent action. The shooting, along with the unrest that followed sparked national discussion on policing, protesting, and political representation in Ferguson and St. Louis Missouri. Civil disorder came in many forms; in the looting and destruction of local businesses, namely a QuickTrip convenience store and gas station which were robbed then burned to flames, the vandalizing of automobiles, and large-scale disturbance of highway traffic. Community protests persisted both peaceful and violent, in stark juxtaposition to the Ferguson Police Department’s heavily militarized presence, which included tear gas, rubber bullets, and stun grenades. This mid-August 2014 unrest boiled into the fall, reverberating with the November 2014 non-indictment of Darren Wilson and subsequent cumulative feeling of justice unserved weighing down on public consciousness, black consciousness in particular. In discussing race and its intersection with issues of policing, protesting, and political representation in Ferguson, it’s essential to look at the role of media in portraying the 2014 unrest. Mainstream media shapes how a society understands racial identity, history, and social institutions. In addition, the assumed audience of mainstream media racial discourse though increasingly inclusive of minority groups, often caters to the perceived needs and ideologies of white America. The Black Voices Project works to highlight a narrative often absent from mainstream media discussion of race and policing. Through interviews with people of color about protesting, police militarization, and political representation in Ferguson and St. Louis Missouri, this project works to depict marginalized voices and uncover driving forces behind civil unrest drawing on the lived experiences of those interviewed. These profiles only show some of the content of interviews with community member, activists, and organizers. Nonetheless, it looks to convey understanding of perspective and identity for possible reclamation and racial inclusion in narratives on civil unrest. Ololade “Lola” Akingbade, is a senior student at Northeastern University in Boston, Massachusetts studying Behavioral Neuroscience and Sociology. Outside of her passion for the sciences, she’s dedicated to racial justice and health disparities action on campus. 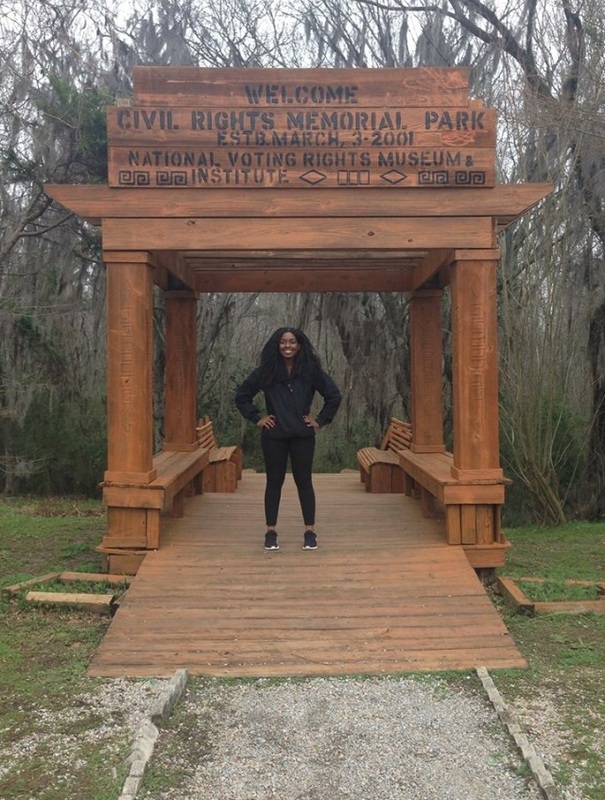 She most recently lead an alternative spring break trip to Selma, AL for the fiftieth year anniversary of the voting rights movement. Her impetus for conducting this project is her continued dedication to the voices, experiences, and livelihood of people of color. She is undertaking this work through the support of the Northeastern Department of Communication Studies and Northeastern University Scholars Program.